A deep backbend when taken to its fullest potential; Ustrasana or ‘camel pose’ mimics the hump of a camel’s back. Backbends can tend to be a little daunting at first, because they’re the opposite action of what we’re now so accustomed to doing; rushing forward, hunching our shoulders, closing off and tensing up. Backbends? They allow us to open up both physically and emotionally, so don’t be surprised is Ustrasana starts to stir up some unexpected sensations. Ustrasana is very much about opening the chest and exposing the heart. The balance of strength and surrender allows us to play the boundaries between control and acceptance. Be sure to respect your boundaries subtly and physically as you move through this potentially powerful pose. Backbends are brilliant for opening the lungs and strengthening the erector spinae (the muscles either side of the spine); they also tend to generally carry with them an energising quality, but you really have to experience Ustrasana yourself to feel what this asana means to you. Make sure you’re properly warmed up before attempting this pose, especially focussing on warming up the back muscles, opening the hip flexors and adding a little core strength to keep you stable throughout the pose. Rise up on to your knees, keeping the thighs, hips and knees in line. For the first round, take your hands to the lower back, fingertips pointing up or down – depending upon what is available to you, and squeeze the shoulder blades together in order to open out the chest. 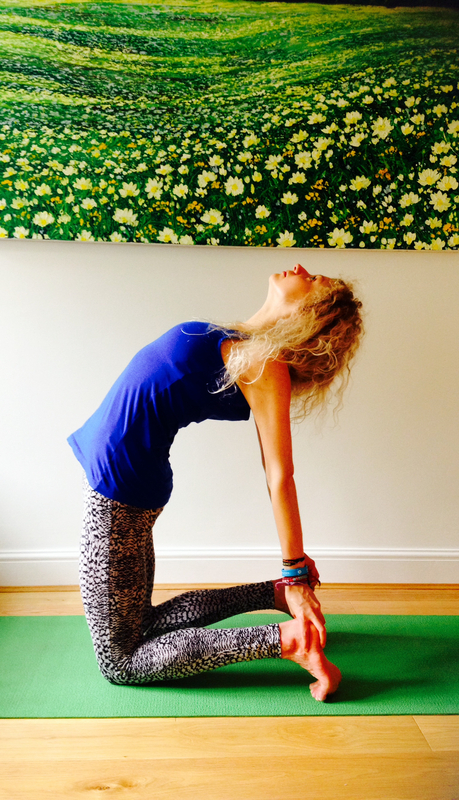 Think about opening up rather than leaning back, and come in to a gentle backbend. If this feels good, you could take the left hand to the left heel and the right hand to the right heel, keeping the toes tucked under. Ensure the hips are in line with the knees at all times! We don’t want to cause compression of the lower back by leaning backwards. You could surrender the weight of the head back, making sure not to crunch the back of the neck, or keep the chin tucked in jalandhara bandha (the chin lock). Still want more? Un-tuck the toes and place the tops of the feel flat to the floor, hands still on the heels. Really focus on opening up the chest and the heart. Stay here for 5-10 breaths depending on how you feel while you’re there and notice what comes up in your mind. To come out, take the hands to the lower back again and really engage your core muscles to bring yourself up. Bend the knees and sit back on the heels if that is available to you. 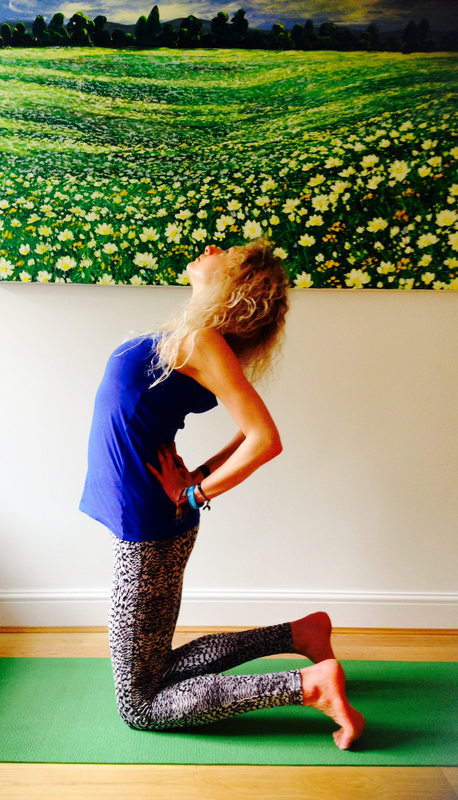 There’s probably an urge to curl up in a little ball to counter pose the opening of the spine here – but resist it! Take some gentle twists first to neutralise the spine, stretch out in a downward facing dog, and then come in to Balasana (child’s pose) with the legs wide apart for a few breaths.Remember to listen to your body as you approach a pose like this; there’s no rush to get in to the deepest backbend possible, you have your whole life to practice it! ← What Makes A Well-Rounded Yoga Practice?